Looking for the best AR 15 soft case for your favorite rifle? Well, we got them for you. All laid out and explained in easy detail and compiled together in one simple spot for you. This is certainly going to make shopping around easier for you! Let’s get started. Before you jump the gun on purchasing a new soft case for your AR 15 it’s a good idea to consider what you’re going to be using the AR-15 for which will help you get the perfect case for your gun. A lot of people use an AR-15 for different kinds of hunting. These usually include predator and varmint hunting but some people also use an AR-15 for deer hunting! If you’re one of these people you’re going to need to be prepared more so than if you’re just taking the gun to the range. This means it might be a good idea to consider the material and resistance of the gun case your buying. Sure, you can find a super cheap soft case but it might be a good idea to consider a case that certainly made of strong, durable material but also waterproof. When you’re hunting with the AR-15 in the woods you don’t always know when the weather is going to change and it can change on you in a moments notice. Having a waterproof soft case will make sure you’re prepared for any weather! The AR-15 is a popular gun for people to purchase to defend their home and loved ones with. Is this you? Well, if you’re getting the gun for self-defense you may not really NEED a gun case. If you have the gun in the case you’re going to be fumbling with it to try and get the gun out when your home is being invaded. We would recommend considering tactical and decentralized storage of your AR-15 and other guns if you have them. This means you’re going to place them strategically around your house like in the kitchen, the guest bedroom and under your bed in the master bedroom. If you only have the AR-15 then the master bedroom might be the best place to store it. Are you just using the AR-15 for target practice? Maybe you’re teaching a youngster how to shoot? If you’re just using it on the range you might be able to save yourself a few bucks by getting a really basic bag. You probably won’t really need all the fancy bags and add-ons or even waterproofing because you’ll have your vehicle right there with you that can tote all your accessories. As far as the waterproofing is concerned you won’t really be toting it through the mountains and most people leave the range when it starts raining anyways. So yea, a simple and basic case would work really well for you in this scenario. While this might be true in some cases it really depends on the situation. For one thing, you might have 10-20 pounds of accessories in the case and that could deter a thief running off with it. Also, a thief might be more concerned about being identified through having your case if someone sees him carrying it. And lastly, you never know if someone close to you might want to steal it and slide it out of their case and into their car then continue to “hang out” with you until they slip away and you find yourself with an empty gun case. With all these things to consider, we leave it up to you to decide on a locking soft case or not. Something else to consider is the cases that hold more than 1 rifle. For one price you can purchase a case that protects 2 of your rifles as opposed to just 1. This can be super useful especially if you’re someone who shoots with your significant other, or maybe your child. Or maybe you just like to have the choice between your two favorite rifles when you’re out on the range. It’s important to consider the material you’ll be using. Most soft cases are nylon or polyester and it’s helpful to know the difference so you can make a choice on what will be best depending on how you use your AR-15. Nylon is a stronger fabric than polyester which means it stretches better than polyester. So, if you carry a lot of accessories and ammo nylon might be better if you’re stuffing the pockets full. Polyester, however, is more resistant to pilling which is when those little fluff balls show up all over the bag. Really, it’s just an aesthetic issue. The last thing about the materials that will probably be most important is that polyester is more water resistant. It’s better at expelling water than nylon so it might be a better choice than a nylon soft case if you’ll be carrying your AR-15 through more weather intensive areas. The Savior Equipment American Classic case comes packed with heavy-duty industrial nylon so you know it’s going to last you. Customers state that it’s an awesome case and the design is unique. One customer even went so far to compare it to the last case that fell apart on him. This one, he says, was ultimately better and the stitching is a professional grade. Some more details other than just some excited customers include the space this bag comes with. It holds two rifles AND two pistols. So you can really roll in hot. On one side it has 3 additional bag compartments you can pack full of ammo and other gadgets you want to bring along with your gun. It’s got lockable zippers on both of the sliders to give you that little bit of added protection for your peace of mind. 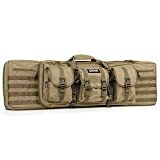 It’s also got a MOLLE grid which is a military tactical setup and arrangement of bags for ultimate efficiency and paracord zippers and even straps to carry it like a backpack. Customers admit that the backpack design is a bit tight to get off of your shoulders easily, but you can simply remove the straps from the installed D-rings to give it slack to easily remove it. Also, to advise there have been customers that report the straps breaking off, although it’s a very few amounts of customers reporting this. It’s good to note though so if you choose to go with this bag you know to perhaps reinforce the straps with something stronger. This is really something you should do consistently with any of your tactical bag equipment. Included Backstraps also have an accompaying chest strap for increased stability and to ensure your bag stays where it needs to even during quick movement. This case is created with polyester material that gives you resistance against fraying and tears and also great resistance to the elements. It comes with the MOLLE grid design for the attachment of extra bags to pack all of your goodies along with you. The case itself will fit up to two of your favorite rifles and has a divider to keep the rifles from touching each other. This divider is even detachable to use as a shooting mat if you want! It’s got highly adjustable straps to be able to carry the rifle case as a backpack with a strap that crosses over your chest for tighter security. There are D rings that have a carabiner attachment that can hold additional accessories, like a water bottle. The paracord zippers are even TSA approved locks which means TSA have access to tools that open these locks easily so you’re allowed put your gun case through the airport checking system and still be locked! A lot of customers have found the bag to be durable and to live up to their standards. Again, some customer’s have issues with a fully loaded case causing the backpack straps to break off so it would be a good idea to reinforce them. Personally, we would reinforce any of our gun cases if we planned to use the backpack feature because gravity puts a lot of force on something vertical and ammo is heavy. The Yongcun is made of the polyester material that gives it the water resistance to help out with the sudden change of elements. The backpack straps are also detachable in case you aren’t using those then you can simply remove them to carry it like a suitcase which is extremely convenient. The guns are secured within the case with velcro straps and come with a divider to keep your rifles separated so they don’t rub against each other as you’re carrying them around. The insides are lined with EVA foam padding to keep your rifles absolutely safe in combination with the velcro straps. 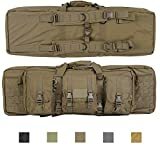 It has three pouches on the front side that will carry your ammo and any other gun tools you might need for the range or for hunting. The only downside that customers have reported is that it has a pretty intense chemical smell from what the manufacturer used to design it. Most customers report that this goes away after some time of letting it air out. The Blackhawk is another case that is using the polyester, water-resistant material and is fully laminated with PVC lamination to give it increased sturdiness and durability. The soft interior padding protects your rifles finish and protects against abrasion. The dual-density foam design helps protect the rifles against any shock giving it a sturdy shock-absorption feature. It has a shoulder case so you can carry it over your shoulder pretty easily or you can use the side strap to carry it more like a suitcase. It also has a lock on the zipper to keep the case locked up and this lock is designed to ensure the zipper doesn’t accidentally come undone so your rifle doesn’t fall out. The bag has 5 additional, thin pockets that are designed to fit extra mags and then two larger accessory bags on each side to fit larger tools and gadgets that you want to bring along. Some people do state that the size is only 34” from end to end when it’s fully zipped up – something to keep in mind. This 36” case is constructed using heavy duty PVC material and fits up to two of your rifles at one time. It’s got the PALS webbing embedded on and has extra webbing on both ends so you can further customize the case to however you see fit. The MOLLE grid sitting on the PALS webbing is preinstalled with three additional storage compartments. The case does come with backpack straps although it’s reported that they’re relatively hard to remove depending on how the stitching was done at the factory. If you’re adamant about using your case with a shoulder strap it might be a good idea to choose another bag that has it integrated into the design of the bag better. Customers report that they are fully loading this bag with 4 guns and even filling up the pockets and it’s working awesome. It has a chest strap for additional security and has enough space to fit whatever you need. The zippers across the entire case are all heavy duty to handle the elements like dirt and dust that are inevitably going to be part of your experience. Customers report that the backpack straps can be tough to remove from the case if you don’t want to use them. Now that we’re here you have a better understanding of the best AR 15 soft case and what you want to look for. You know what kind of material to look for and the benefits it gives you and if you desire the case to be able to lock up or not. You can assess which case is going to be best for you based on space as well and how many guns you want to fit. It’ll also give you an idea of what to focus on depending on what type of shooter you are. That’s it for now! Shoot true!